The Navman N20 is pre-installed with comprehensive UK maps and includes 3.5-inch touch screen, full postcode search, speed cameras, 3D maps and built-in NavPix technology. Navman's optional Traffic Pack is subscription-free and connects with the N20 in seconds. Navman N20 has been discontinued. Accessories, spares and parts are still available for your N20, as are Australian road maps. The Navman N20 satellite navigation system is a slender 22mm wide, includes 3.5" touch screen, full postcode search (including UK 8-digit postcodes) and the 'Nearest Parking and Petrol buttons' mean the closest petrol station or car park is only a click away. And as you'd expect from Navman, pre-loaded speed camera data, clearly spoken directions and touch screen operation guide you to your destination. The Navman N20 optional Traffic Pack is subscription-free and connects with the N20 in seconds. Giving you ample notice of trouble spots ahead, the Navman N20 quickly calculates an alternative route taking the stress out of driving and keeping you moving. Navman's subscription-free RDS. TMC service sends up to the minute live traffic information directly to your device, enabling you to change your route and make traffic delays a thing of the past. NavPix combine exact geographical information with an image. Letting you create an unmistakeable and easy way to identify a destination. And because it already contains the latitude and longitude, you simply select the image of the destination you want and off you go. The Navman N20 has been designed to be Plug & Play, and as such can be transferred from vehicle to vehicle with ease by the user. The Navman N20 is powered with a 12-volt adaptor cable in-car. The provided mains A/C power adaptor allows for use in the home or office, when configuring a route (cables included). The Navman N20 works with Tele Atlas Maps to provide detailed maps of the UK. Tele Atlas Maps provide high quality, detail rich maps, which in addition to street information include features such as route calculation, Points of Interest, Estimated Time of Arrival, and more. Further Navman N20 maps are available SD card which insert directly into the Navman N20. Available Navman N20 maps include, Western Europe, Eastern Europe, North America and Australia. 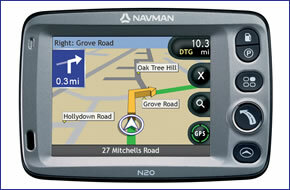 View the complete range of maps available for the Navman N20. Although the Navman N20 has been discontinued, a number of accessories are still available to buy from ActiveGPS. These accessories and spares include: vehicle power cable, windscreen suction mount , mains power charger, remote control, T1 Traffic Pack and external GPS antenna. Navman N20 maps with the exception of Australia have now all completely sold out. Question: I have Navman N20 from 2006 and in perfect working order APART from the speaker for audio instructions has blown. I have opened Sat Nav and uncscrewed and disconnected speaker. Do you stock a spare one for my Sat Nav. Answer: While we sell Navman N20 accessories, we have never sold internal parts such as speakers and screens. I would suggest you buy a secondhand Navman N20 on eBay and remove the speaker from another N20 sat nav. Due the age of the device I very much doubt that Mio Navman will be undertaking repairs/replacements as they would have done so in the past. Do you have a question about the Navman N20? Submit your question via our contact page.